As business technologies and customer service best practice change so quickly, we’ve put together a list of top call centre software for UK companies to use in 2019. 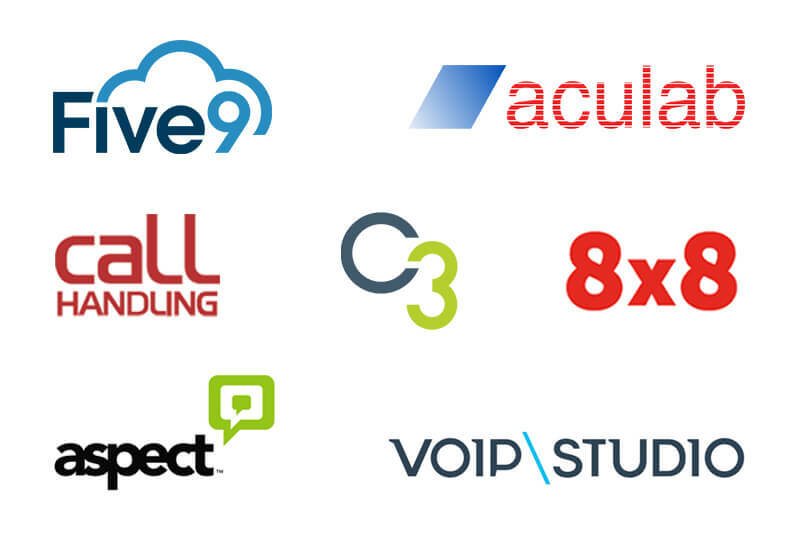 8X8 is a complete suite of cloud communications solutions that has over 1 million business users across the globe. Their software includes include hosted VOIP for business telephony, video conferencing systems, call centre operations and team collaboration tools – all with business intelligence built in. They have solutions suitable for small businesses through to medium size companies and large enterprise. This multi award winning company has clients that include the likes of Regus, NetSuite, Shimano and McDonald’s. Aculab offers a range of telephony hardware and software solutions, including apps for inbound and outbound calls, SMS and more, without the need for specialist telecoms equipment. The company also offers voice biometrics with their innovative VoiceSentry speaker verification and authentication software. Their ASR / TTS applications deliver multilingual speech recognition and text to speech capabilities. The Aculab suite of solutions is used by some of the best known UK and global brands, including BT, Avaya, NHS, Siemens, Network Rail, Cisco and more. Aspect is an integrated call centre platform for customer engagement and workforce optimisation. IVR / Chatbots – innovative digital options to help customers resolve problems and source information autonomously if they want to. Aspect’s clients include Edwardian Group London, RS Components, Hoist Finance and Severn Trent Water. The company has been established for over 25 years. Five9 is a specialist cloud contact centre software provider, offering solutions for Sales & Marketing, and Customer Service & Support. Recognised by Gartner as a Leader for Contact Centres, Five9 Virtual contact centre software includes solutions for in-house, work from home and outsourced agents to manage communications across phone, web, email, chatbox, SMS and social. Their CRM integrations include: Salesforce, Zendesk, Oracle Service Cloud, Microsoft, Netsuite, Zoho, SugarCRM and more. VoIPStudio is a business VoIP solution that aims to offer enterprise-level telephony services that are affordable for companies of any size. Their browser based call software allows you to create and manage conferencing, IVR, recording of calls and more, quickly and easily. This business VoIP telephony allows you to make calls via desktop phone, smartphone or tablets, and is deployed in over 75 countries. Call Handling is a provider of solutions for multi-channel, cloud contact centre operations. Established in 1999, the company has solutions for call centre management, PCI compliant card payment processing, and lone worker support. Clients of Call Handling have included hundreds of well-known UK brands, including British Heart Foundation, Argos, NHS, Harvey’s Furniture Store, University of Oxford, Topps Tiles, Terence Higgins Trust, Habitat, University of Leeds, Selfridges & Co, and many more. If you’re a call centre manager or leader looking to improve customer service or agent performance, then one or more of these leading software solutions could be ideal to help you hit targets and find a competitive edge. Our call centre training solutions have improved learning and performance for clients such as Lloyds Bank, Co-op and TSB, using system simulations and scenario based elearning. Call Centre Performance & Training Strategies – Industry Insights from Our Team – we have staff members with nearly 40 years of combined experience at all levels within UK and global contact centres, across sectors that include FMCG, Banking, Finance & Insurance, Telecoms, Retail, Betting & Gaming, and Supermarkets.